Col. Edwin E. Aldrin, Jr., better known as Buzz Adrin, was one of the three American astronauts on the historical Apollo 11 mission, during which, on 20 Jul 1969, he followed Neil Armstrong out of the lunar landing craft, and he became the second man to set foot onto the lunar surface. After their return, the three astronauts received, three weeks later on 13 Aug 1969, with the Medal of Freedom. This, the highest civilian honor, was presented by President Richard Nixon at a dinner in Los Angeles, for their participation in the first manned moon landing mission. The eveent was attended by representatives of 83 countries. “Thank you, Mr. President. I feel that the honor you have given us goes not just to us as a crew but to countless thousands of others. Some are here tonight. Many cannot be. It goes to hundreds of thousands of Government and industry people who have strived over 8 long years on Apollo. Their success and the steppingstones of Apollo 7, 8, 9, and 10, gave us the opportunity to take Apollo 11 to the moon and land. It is an honor, in a sense, that goes to all Americans who believed, who persevered with us. Across this country today, we saw how deeply they believed. We saw it by their spontaneous enthusiasm and warmth of greeting for us. Our flight was your flight. We flew Eagle and Columbia with your hands helping us on the controls and your spirit behind us. When Neil and I saluted the flag, all Americans, I think, saluted it with us. We hope that the proud emblem of the American Eagle, carrying the olive branch to the moon, may inspire a new generation. The words you spoke to us, Mr. President, that incredible night on the moon, summed up many of the feelings which we have felt today from the people of this great country. What Apollo has begun we hope will spread out in many directions, not just in space, but underneath the seas and in the cities, to tell us unforgettably that we can do what we will and must and want to do. Never before have travelers been so far removed from their homelands as we were. Yet, never before have travelers had so many human beings at their right hand. 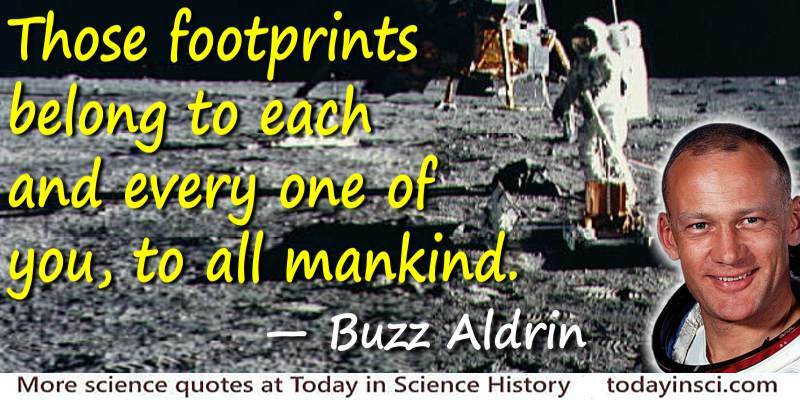 There are footprints on the moon. Those footprints belong to each and every one of you, to all of mankind, and they are there because of the blood, the sweat, and the tears of millions of people. These footprints are a symbol of the true human spirit. “Mr. President, here stands one proud American, proud to be a member of the Apollo team, proud to be a citizen of the United States of America which nearly a decade ago said that it would land two men on the moon and then did so, showing along the way, to the world, both the triumphs and the tragedies--and proud to be an inhabitant of this most magnificent planet. As I looked at it from nearly a quarter of a million miles away, 3 weeks ago, the people of New York, of Chicago, and of Los Angeles were far from my mind, frankly. But tonight, they are very close to my mind. I wish that each and every one of you could have been with us today to see their enthusiasm and the magnificent greeting which they gave us upon our return. “We were privileged to leave on the moon a plaque endorsed by you, Mr. President, saying “for all mankind.” You, too, took a trip, as you pointed out, around the world and carried that message to all mankind. Perhaps in the third millennium a wayward stranger will read that plaque at Tranquility Base and let history mark that this was the age in which that became a fact. I was struck this morning in New York by a proudly-waved, but uncarefully scribbled sign. It said, "Through you, we touched the moon." Through you, we touched the moon. It was our privilege today across the country to touch America. I suspect that perhaps the most warm, genuine feeling that all of us could receive came through the cheers and shouts and, most of all, the smiles of our fellow Americans. Science Quotes by Buzz Aldrin.